The early 1980s brought a new novel to the kids section: The BFG by Roald Dahl. The BFG aka The Big Friendly Giant, was written by Dahl for his seven year old daughter Sophie, who had died of measles encephalitis in 1962. The story had its premier within a previous novel, the 1975 book Danny, The Champion of the World. In this fantastical story, the lead character is Sophie survives a car accident that has killed her parents and she’s now living in an orphanage. One night, she can’t sleep and sees a strange sight – a giant with a trumpet. He notices her and takes her from the orphanage to his home in a cave. She’s afraid, but he reassures her that he is friendly and won’t harm her. The giant tells her she cannot leave him, that his giant neighbours are dangerous and could harm her and that he gathers dreams with his trumpet and gives them to kids. Sophie helps the giant to gather dreams, but they come into conflict with the other giants. She then enlists the Queen of England to help rescue The BFG and puts together a plan to thwart the evil neighbours from attacking humans. 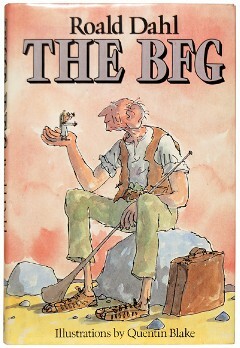 The BFG was published in 1982 by Jonathan Cape in the UK and by Penguin Books in the US and Canada. Selling over a million copies a year, this novel remains one of Dahl’s most popular and has sold over 37 million copies in the UK. In 1989 an animated adaptation of the novel was created for television. The BFG has been adapted for the stage and a theatrical live action production was done for film by director Stephen Spielberg in 2016. In 1975, Roald Dahl wrote a children’s book based on an adult short story and made a hero in Danny, The Champion of the World. In 1959, Dahl published a short story in the New Yorker Magazine titled Champion of the World, about adults and how they are poaching from the rich to feed themselves. Fast-forward to the mid 1970s, where Dahl took the story and focused it on young dDanny, who is being raised by a single Dad after his Mum died when he was an infant. They live in a caravan in the forest in England. He soon realizes that his Dad goes out at night to poach birds from the neighbouring lands and that his grandfather was also a poacher. One night he wakes to find out his Dad hasn’t come home. He finds his Dad caught in a trap set by wealthy landowner Mr. Hazell on his property and rescues him, but his Father now has to recuperate at home with a broken ankle. Upset at Mr. Hazell, Danny decides to sabotage his annual pheasant hunt to impress the local lords and ladies by drugging the pheasants and hiding them so there will be no birds to hunt. He works with the village doctor to get sleeping pills to kick off his plan. Sneaking drugs inside raisins, Danny captures all the pheasants and then works with Mrs. Clipstone, the wife of the vicar, to hide the birds. But does he succeed? And will the village protect him from the outrage of Mr. Hazell? Published in 1975 by Jonathan Cape in the UK, the book was published in North America by Alfred A. Knopf. Dahl, who had begun his writing career while living in the US, started writing for kids when he had moved with his family to England, and dedicated those books to his kids. He owned a vardo, a traditional Romani home, and used it as a writing room for when he was working on Danny, The Champion of the World. When I read the book as a kid, I was sympathetic to Danny and his Dad, who were trying to make ends meet and didn’t fit in with the rich kids. And foreshadowing happens in this popular (and very successful novel) with the Dad telling Danny a bedtime story, which became the novel, The BFG. This novel became a film in 1989 starring Jeremy Irons.